September | 2014 | Daniel Katz, Ph.D.
Student achievement data in the U.S. show long-standing and persistent gaps in minority versus majority performance (Vasquez Heilig & Darling-Hammond, 2008). Public concern about pervasive inequalities in traditional public schools, combined with growing political, parental, and corporate support, has created the expectation that school choice is the solution for poor and minority youth (Vasquez Heilig, Williams, McNeil, & Lee, 2011). As a result, many reformers have framed school choice as a “civil rights” issue. Scott (2013a) argued that philanthropists, policy advocates, and leading pundits have followed Secretary Arne Duncan’s conjuring of Rosa Parks and the broader Civil Rights Movement as synonymous with market-based school choice. It is notable that the school choice movement counts on prominent African American and Latina/o leaders to support vouchers, charters, parent trigger, and other forms of choice….In our recent Twitter exchange, (former California State Senator Gloria) Romero framed her bill as a civil rights remedy for low-performing schools. Clearly, African American and Latina/o leaders have formed advocacy coalitions to press for school choice as an alternative to the status quo as our nation has consistently and purposefully underserved students of color (Scott, 2011). In the 21st century, we are exhorted to education reformers’ policy agenda by language invoking the struggles undertaken by some of our most heroic figures, Dr. Martin Luther King, Jr., Rosa Parks, Representative John Lewis, and told that the best way to close the historic education achievement gap between suburban white children and their urban African American and Latino peers is to embrace highly disruptive change. We are further told that all of our children are still “at risk” because even in the well-off communities of our upper middle class, students are not learning what they need in a global economy. Without education reform, our impoverished students will remain locked in poverty, and our comfortable students will slide into stagnation. For the sake of this discussion, let me do something I never do. Let me assume, momentarily, that the education reformers are correct. Assume that common standards and aligned mass assessments will create a seamless system of curricula that challenge students meaningfully, and that those standards encompass a strong vision of student accomplishment. Assume that adoption of the standards and assessments narrow the differences between states and districts so that expectations remain high for all students. Assume the assessments are well-crafted and valid measures that stand as good proxies for student learning. Assume value added measures of teacher evaluation are statistically valid and supported by a robust body of research. Assume that eliminating the job protections of tenure would mean that vast numbers of students would have greater contact with skilled teachers and that there would be no negative consequences to the rest of the teacher workforce. Assume that the proliferation of charter schools in urban school districts would give vastly more students options to attend a high performing school and that pressures from school choice schemes would increase the quality of zoned schools. Assume that urban charter schools fully serve all students who arrive at their doors. Assume that the advocates of “no excuses” charter schools are correct and that they genuinely demonstrate that closing the achievement gap can be accomplished entirely within school through teachers armed with extremely high expectations. Assume every last bit of that is true. This is a more critical question than many realize because even if the performance gaps in American education closed overnight, we would still need an economy that can accommodate many more and more equitably distributed high performing graduates than we currently have. Advocates of current reforms certainly seem to be banking on this. Jonathan Chait of New York Magazine recently wrote that Eva Moskowitz of the Success Academy charter school network should be considered a “hero of American social justice,” and he declared that her schools have “been a staggering triumph of upward mobility.” That’s quite a claim to make for a chain of schools whose oldest students have just begun high school, and, in fact, it rests almost entirely about the network’s accomplishments in state administered standard examinations. Former New York City School Chancellor Joel Klein does not want to talk about the complicating factors surrounding Success Academy results, nor does he spend time considering how far such results could be replicated. Success Academy fits into a narrative that believes schools and teachers are fully responsible for providing all of the lift out of poverty. 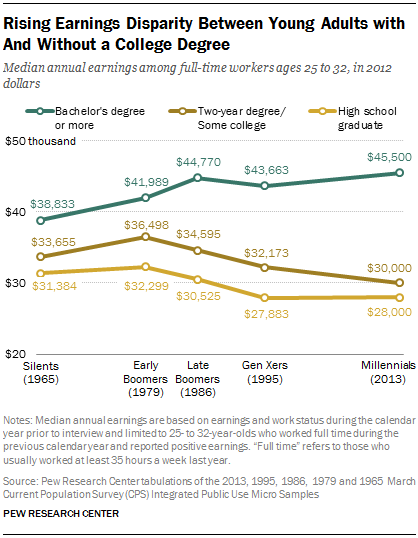 While a Millennial with a college degree earns a wage that is $730 more than a late boomer with the same degree, the wage trends for those with either a two year degree and no degree have dropped precipitously since the early 80s compared with decades of modest but steady growth before. A college degree may be necessary for a middle class career today, but more and more, it looks as if the degree is more a means to keep from falling into chronic income insecurity rather than as a genuine means of economic advancement. If the middle class is increasingly a tenuous position in the American economy, it is even worse for the lower middle class, an economic stratum that has traditionally helped families transition from working class to more economically secure circumstances. According the The Hamilton Project at the Brookings Institution, nearly half of American families live at 250 percent of the federal poverty level (FPL) or below, and 30 percent live between 100 percent and 250 percent of the FPL. Unlike families below the poverty level, such lower middle class households are equally likely to be headed by a married couple or a single parent, and nearly half have a head of household who has attended at least some college. The report on their economic struggles notes that, despite living above the poverty line, large percentages of these families rely upon a number of tax and transfer benefits such as SNAP and the Earned Income Tax Credit to remain above the FPL. Indeed, without many of these programs, the number of families that would slip from an unsecured lower middle class to simple poverty is significant. 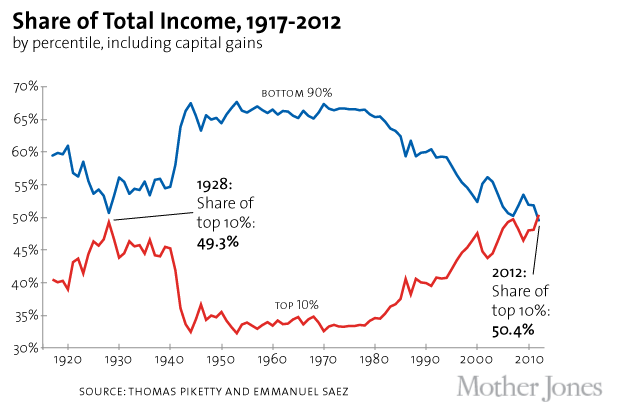 As a transition point from poverty to a more secure middle class, the lower middle class is faltering badly. 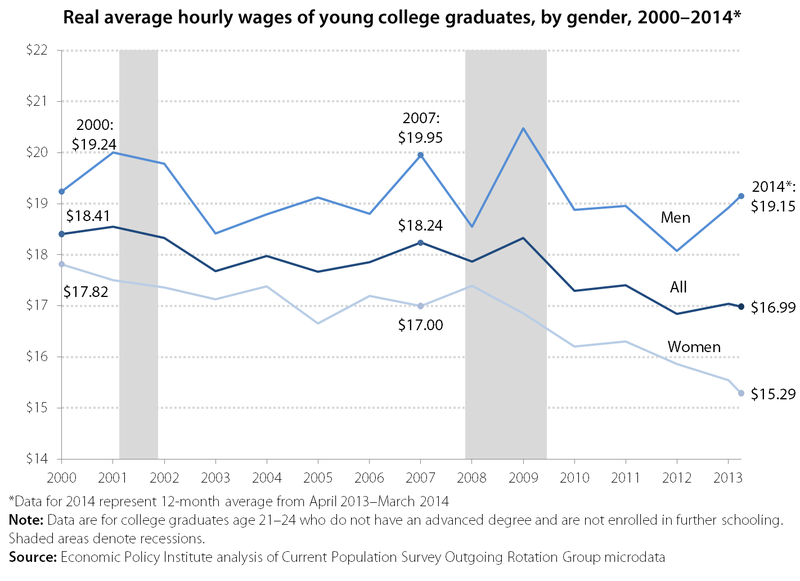 If college graduates were in short supply, basic labor economics dictates that businesses competing for them would have to offer higher wages, but even in the vaunted STEM fields, wages, while higher overall than in non-STEM fields, have not grown significantly for most of the 21st century. Reality suggests that even if all education reform assumptions were true, graduates of a “properly reformed” school system would still graduate into an economy that is not equipped to lift them from poverty and that is barely equipped to maintain those in the middle class where they currently reside. The recently published study by Karl Alexander of The Johns Hopkins University, The Long Shadow, illustrates just how complex and potentially unsuccessful the rise from poverty can be. Out of 800 children studied from first grade to their late twenties, only 33 moved from the low income to the high income bracket. While a good education is certainly a PART of a pathway out of poverty, it is by no means the ONLY way out, and with more and more workers in the economy struggling to keep pace, it is perverse to suggest that we bestow upon schools the sole responsibility for lifting children from poverty. And, of course, we know that we cannot grant the reformers that their agenda will work because much of it simply will not or is built upon faulty and deceptive claims. Common standards are being implemented in 45 states simultaneously with virtually no field examination of whether or not they improved instruction at the classroom, school or district levels. Evaluating teachers based on Value Added Models is problematic at best, statistically invalid at worse. There is scant to no evidence that the elimination of teacher tenure is going to significantly improve the teaching in urban schools, and, in fact, the states with the weakest teacher job protections tend to be states that perform very poorly on national assessments. Success Academy, despite claiming to teach similar high need populations as NYC district schools, has a very high attrition rate, and they do not replace students who leave. This is a trait shared with many other “no excuses” charter schools who eventually have student populations with many fewer disabled students, English language learners and students on free and reduced lunch than their district counterparts. They combine the selective attrition of the most difficult to teach students with an extreme emphasis on discipline for even minor infractions of the rules and, at Success Academy and elsewhere, a curriculum aimed at test preparation. While there is little evidence yet that such test performance training will result in long term economic success, there is evidence that charter school expansion can make segregation actually worse. And this is where reform advocacy devolves from being merely wrong-headed and into territory that is dangerously close to immoral. America has one of the highest child poverty rates in the developed world. It is well established that poverty and its deprivations have serious, often lifelong, impact on people in health, education and economic outcomes. While improving educational opportunity for children in poverty is a necessary component of expanding opportunity, left to its own, education reform, ANY education reform, cannot make significant dents into the roadblocks that stand before our nation’s poor. We do not have an economy where the lower middle class can survive on the wages offered for their work. We do not have an economy where 90% of the wage earners possess more than 49 percent of the total income in the country, and we do not have an economy where the often expressed need for college educated workers has led to growth in income earned by college graduates. Worse, we have accepted no society wide responsibility to address child poverty in any meaningful way that would lift more children into the economic circumstances more highly correlated with school success than any other factor. In fact, as a society, we have responded to current economic circumstances with demands to cut discretionary programs in ways that can directly harm children, deepening the already woeful health, education and economic outcomes for children in poverty. Matt Bruenig of Demos, estimates that with an investment of 1% of GDP in a straight transfer program, child poverty could be cut by 50 percent, almost instantly. He further points out that our 24 percent of GDP taxation level is among the lowest in the developed world, and it is hard to argue that there is no room for an extra percentage point of GDP. But there is no political will to discuss this or other direct approaches to lifting people out of poverty in our government. More accurately, there is no willingness for the major political donors who effectively leverage significant portions of policy in America to do anything that changes either the economy or their taxation levels. There is, however, significant interest in bypassing those discussions and placing all of the responsibility to both transforming our economy and for lifting disadvantaged children from poverty upon teachers and school. It fits the meritocracy narrative, and it may tug at our cultural bias towards individualism in the face of daunting odds. Back in April, I wrote extensively about how New York Governor Andrew Cuomo lost my vote, not merely in the primary but for any election he intends to run in, ever. The upshot is that his treatment of public in education in New York State has been so harmful and so devious that it is obvious that he has no interest whatsoever in doing anything for schools other than acting at the behest of his donors. Governor Cuomo’s budgets have strangled local school aid, and his tax policies have prevented districts from making up shortfalls. His Common Core implementation has been overly disruptive, and his administration is enthusiastic about using poorly designed examinations to fuel statistically invalid evaluations of teachers. The governor reached a breath-taking low in Eva Moskowitz’s campaign to prevent her charter school chain from having to pay rent in New York City, and the governor, as reported in the New York Times, did not merely stand by her — he actively made her rally in Albany against Mayor De Blasio happen. Thanks to his efforts, the state budget REQUIRES New York City to pay Moskowitz’s rent even though her charter school chain is so flush with cash from hedge fund donors that she can unleash a multi-millon dollar attack campaign on almost no notice whatsoever. All of this is tied fairly directly to the overlap of donors between Cuomo and the charter school market in New York. Charter school investors have managed to make them work as an investment vehicle for themselves, and they have donated heavily to politicians who they believe will keep ordering more charters to open. If you want to know how Governor Cuomo will decide on an education issue, you can save yourself the trouble and consult the wish list of “Democrats for Education Reform“, the astroturf organization set up by hedge fund manager Whitney Tilson mostly to put political pressure on Democratic politicians to support unfettered expansion of charter schools and to do so by funneling money donated from interests like the Walton Family Foundation through them and to candidates. Is it any wonder that when the supposedly independent Moreland Commission to Investigate Public Corruption actually dared to do its job that Governor Cuomo abruptly shut it down? Teachout and Wu offer a positive vision of governance. Zephyr Teachout and Tim Wu endorse the vision of an “open democracy” that would enhance the values of our society and live up to the towering but often unfulfilled rhetoric of American inclusiveness. America’s greatest stories are those when we have enlarged the franchise to embrace historically marginalized and ignored populations, and the Teachout/Wu ticket endorses this openly. Teachout and Wu are not bought. Martin Gilens of Princeton University and Benjamin Page of Northwestern University shook up the political and pundit classes with their study that concludes the United States has become an oligarchy. Their conclusion was based upon analysis that found policies were more likely to become law when backed by the small proportion of the population that wields economic power — even when such policies are disliked by super majorities of the voting population. Governor Cuomo, as demonstrated by his public education policies, listens to the donors who can marshal 100s of 1000s of dollars for his campaign coffers even when it comes at the expense of properly funding our schools. Having candidates like Teachout and Wu on the ballot allows voters to endorse representatives who are not bought and paid for by the current campaign finance system and who have pledged to change that system. And despite the depressing conclusions about our current oligarchical trend, I see hope because money may sway policy, but it does not always sway elections. If money always won at the ballot box, then Linda McMahon would be a United States Senator (twice), so voters still hold one power that gets elected officials to sit up and notice: the power to keep them from office via the vote. Teachout and Wu have the expertise we need today. Zephyr Teachout is a nationally recognized expert in government corruption. Tim Wu is a fierce advocate of an open Internet and coined the expression “Net Neutrality.” What are two of the most pressing issues for the future of our democracy? Corruption and whether or not our digital infrastructure will remain a place of opportunity and equal access. Unfortunately, our government is not listening to the experts on these issues, falling again for the advocacy of cash. If the government will not listen to expertise, then it is perhaps time to place expertise in the government. Teachout and Wu believe the education is a vital part of our national commons. For the past dozen years, our education system has been warped far from its role to provide individual opportunity and to provide our citizenry with the knowledge and skills to fully participate in a democracy. Current education “reforms” make education serve private interests and, preversely, private profit while claiming the mantra of civil rights and educational opportunity — even while they increase segregation and starve fully public schools of funds and resources. Teachout and Wu see through that veil to the fundamental threat to public education and, by extension, to the threat to democracy itself. Even if Teachout and Wu lose, we can win something important. Governor Cuomo has ambitions. There is little doubt in my mind that he sees the Oval Office in his future. Given the version of corrupt, oligarchical politics that he represents, it is vital that he not cruise back into office in November. If Teachout and Wu gain even a significant minority in the September 9th primary, Governor Cuomo’s armor will be tarnished on the national stage, and national Democrats will have to acknowledge that they cannot ignore the liberal vote in pursuit of unlimited campaign cash. This is not as impossible a task for national Democrats as it may seem. In poll after poll, the national electorate favors policies that are far more progressive than are politically viable because of the campaign financing system under which we currently suffer. If voters finally refuse to vote for politicians tied to oligarchs instead of to the people, that can begin to change. When I disagree with Teachout and Wu, the reasons do not make me angry: Governor Cuomo’s education policies are disastrous, and, worse, he arrived at them by doing the will of campaign donors who are serving their own interests. I do not agree with Teachout and Wu on every single issue, but those positions are the results of their personal convictions and their study. Those are differences with which I can discuss and for which I have respect. I am happy that I will be voting FOR Zephyr Teachout and Tim Wu on September 9th. If you are a Democrat in New York, I urge you to do the same. We need to send a message. We need to vote for values that truly resonate with our own. We need to say that we demand better.